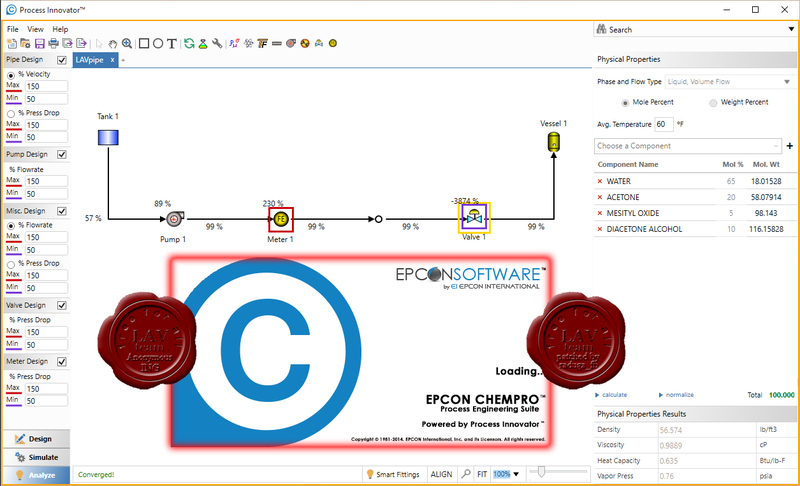 EPCON offers a range of fluid flow software solutions that enable users to simulate and analyze fluid flow, oil and gas thermodynamics, physical property components, equipment sizing and cost estimation, flare header analysis, pressure relief valve analysis, and process simulation. 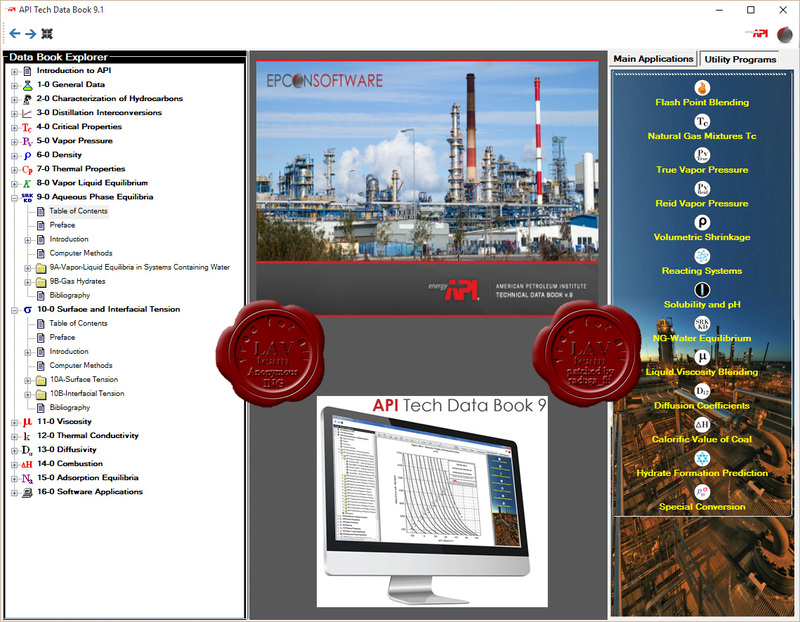 The API Tech Data Book is the only API standard that is fully interactive. Read the standards, check the referenced methods, and run computations based on these methods all at the same time. The API Tech Data Book, co-published and updated annually by the American Petroleum Institute and EPCON International, is the only source for the latest, most accurate technical data, methods, and standards on petroleum refining officially sanctioned by the American Petroleum Institute. 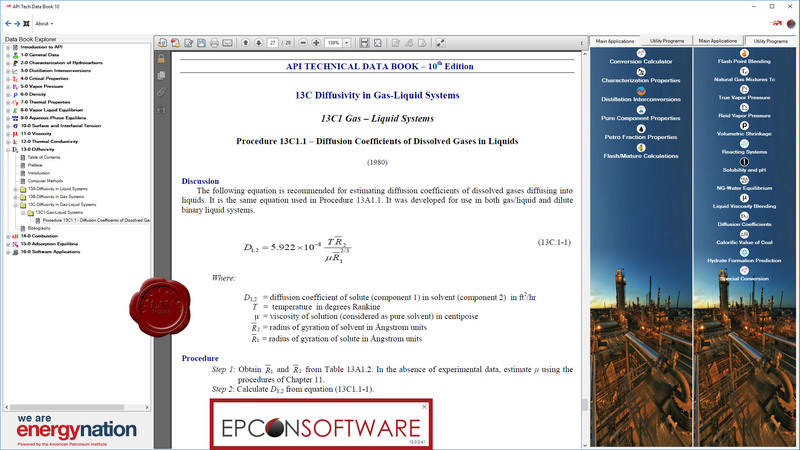 Whether you need to run calculations for characterization properties, distillation interconversions, pure component properties, mixture properties, or property estimation, the API Technical Data Book provides the complete solution. There is no longer a need to use a complicated simulation software package to get the physical property data you need for process equipment sizing, fluid flow computations, etc. Other software applications include flash point blending, natural gas mixture critical properties, reacting systems, liquid viscosity blending, and special unit conversions, just to name a few. CHEMPRO simulates liquid, gas, and multi-phase piping systems. Included are all of the features of SiNET with links to the API Technical Data Book, the API Equipment Data Sheets, SYSTEM 7 Process Explorer, and DDBSP. CHEMPRO also provides optional process safety solutions with the Pressure Releif Valve Analysis and the Flare Header Backpressure Analysis programs. The company’s flagship product SiNET allows engineers in the chemical and refining industries to design piping systems efficiently and safely. Its design capabilities include looped and branched systems, up to 1000 pipes, and an array of equipment types. In addition to fluid flow systems design, simulation, and analysis, SiNET also has the ability to estimate equipment cost and quickly generate detailed reports.